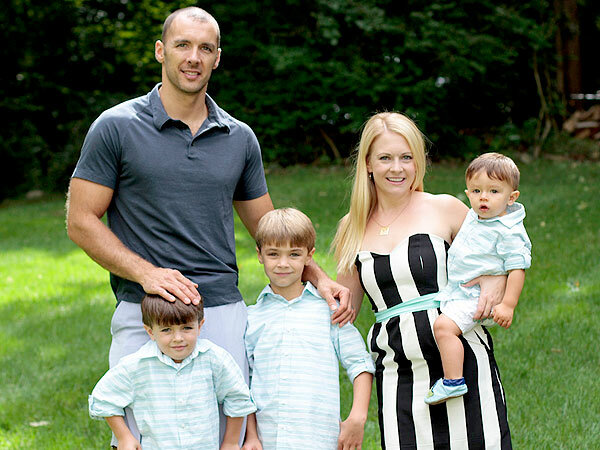 On Saturday, Melissa Joan Hart welcomed 55 friends and family (including 35 kids!) 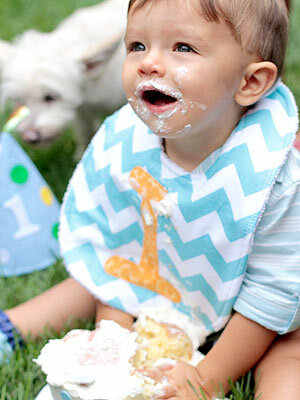 to the backyard of her Connecticut home to celebrate her youngest son Tucker McFadden‘s first birthday – and the unbearably adorable afternoon went off without a hitch. “This is the first party I’ve gotten excited about in awhile because I had the energy and the time to spend on it,” Hart, 37, tells PEOPLE exclusively. 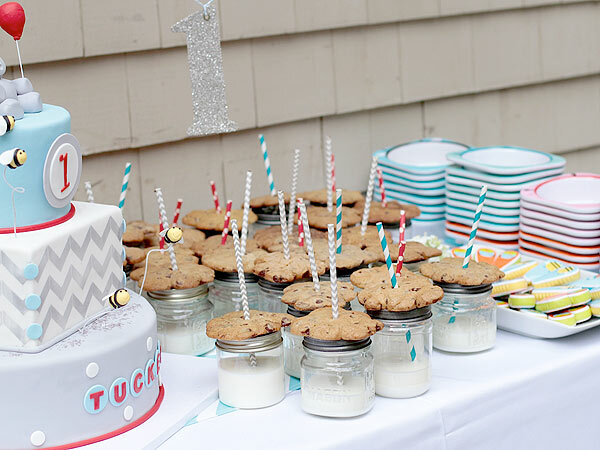 With her teddy bear picnic theme in mind, the mom-of-three started planning the perfect party for her baby boy, turning to her latest obsession – Pinterest! – for inspiration. In an effort to keep it kid-friendly, Hart – who wore her Posh Mommy necklace for the big day – and her husband Mark Wilkerson served finger foods with a little help from Katie’s Kitchen, including mini PB&Js, mac and cheese bites and fruit skewers. Adults sipped on sangria while the younger guests enjoyed lemonade. 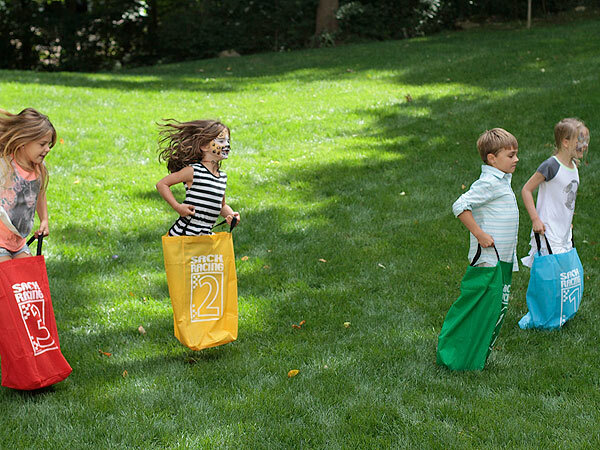 As the infant and toddler guests lounged on blankets adorned with stuffed animals in the grass, the older children enjoyed sack races, bocce ball, croquet, bubbles and time on the trampoline. The hardest part proved to be inserting the straws into her milk and chocolate chip cookie set up, which included glasses topped with the sweet treats. A dessert table offered an assortment of bear-shaped cookies stored in Itzy Ritzy snack bags and take-home Dine food jars from Zoli, where guests could stock up on goodies from the colorful candy buffet. For the birthday boy’s big treat, Hart came across a cute cake on Pinterest and then asked a local bakery, The Cake Boutique, to tweak the design by adding a teddy bear topper to the tiered creation. 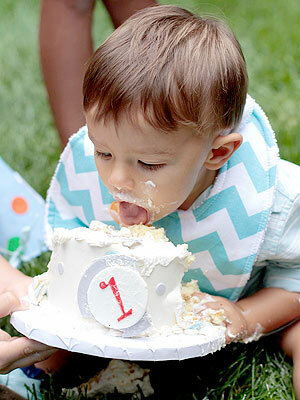 “Tucker had his own – it didn’t have any strawberry or Oreo pieces in it like the rest of the cake, so nothing to choke on and a little less sugar,” she shares. After Tucker took his time taste-testing the dessert, his proud parents began to tidy up – only to realize the family dog had joined the cleaning crew. “When he was done, we ran him inside to clean up and when we came back out, Copper had eaten the rest,” she says with a laugh. While each child went home with a goodie bag filled with Mabel’s Labels and Funkins products, the family asked guests to forgo gifts. 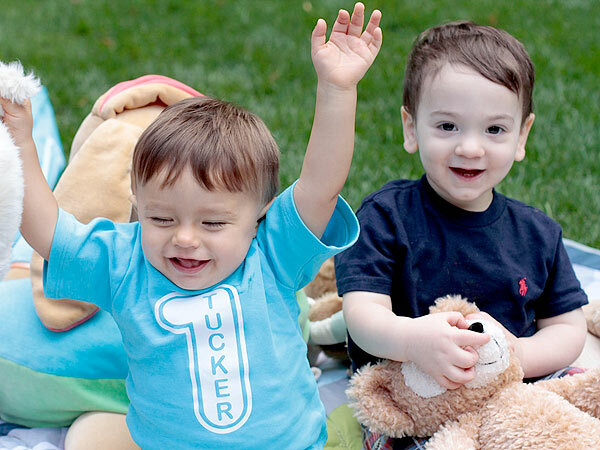 Instead, those that wanted could make a donation to Save the Children in Tucker’s name. 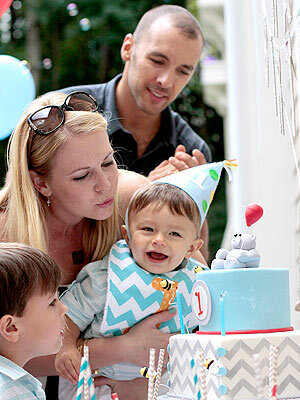 Now having celebrated the major milestone of a first birthday with each of her boys – Hart is also mom to sons Mason, 7 , and Brady, 5 – she admits she has yet to shed a tear during the fun festivities. “I’m not a super emotional person, except when I’m pregnant. I’ve never been one to cry happy tears – even at my wedding. Mark had tears down his face and I was just so excited to actually get married,” she explains. Hart’s most recent reminder of Tucker’s fast-approaching toddler years include the coming addition of a few teeth – plus the possibility of showing his loyalty for the family’s favorite football team. The family of five has been enjoying their summer on the East Coast, but will return to Los Angeles for a few months once Hart’s show Melissa & Joey starts filming. Despite the temporarily bicoastal schedule, the actress makes it a priority to put her children’s childhoods first. “Now that we have Tucker, everyone will come out. We tried with me going back and forth and it was just too much – it’s not an easy schedule. The boys like traveling, they adapt easily and make friends all over, but we really try not to let the business of life get in the way, no matter how hard it is,” Hart shares. Adding to her already full plate is the Oct. 29 release of Hart’s memoir, Melissa Explains It All, an autobiography she penned while pregnant with Tucker. “I was trying to figure out what to do with my time, since I wouldn’t be on camera. I pitched the book, they were interested and I ended up spending most of my pregnancy with a computer on my lap typing up chapters between errands and naps,” she says. Despite her good girl reputation, Hart reveals some of the pages are anything but, touching on the highs and the lows. As she continues to achieve both personal and professional success, Hart – who says she’s “always wanted four kids” – plans to enjoy her fit form for just a bit longer.